Beauregard the Jackapoo at 9 months old—"He weighs in at a hefty 16 lbs., and boy does he like to throw his weight around! He's very smart, so we can't put anything over on him...and has learned to "talk". He vocalizes distinctive "words" (mama, out, play ball). While it's not quite English, he can definitely communicate what he wants. We call it "Beau speak."" The Jack-A-Poo is not a purebred dog. 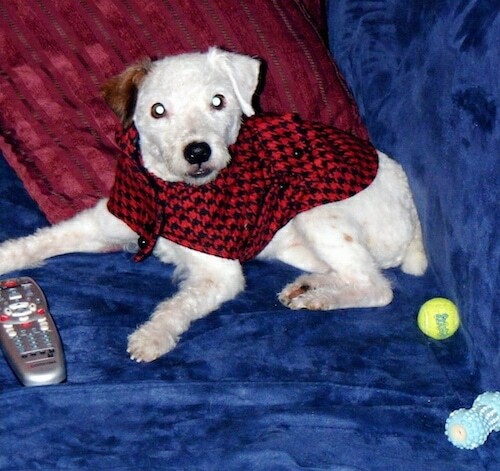 It is a cross between the Jack Russell and the Poodle. The best way to determine the temperament of a mixed breed is to look up all breeds in the cross and know you can get any combination of any of the characteristics found in either breed. Not all of these designer hybrid dogs being bred are 50% purebred to 50% purebred. It is very common for breeders to breed multi-generation crosses. 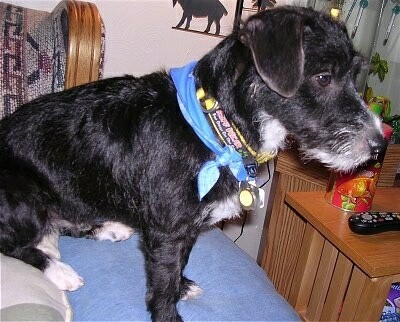 Oreo the Jackapoo at about 3 years old—"This is the big man himself, Oreo Von Kirkland. Here he is on a walk. I had stopped to see how he'd react to the many distractions of the park (a small herd of deer had run by, causing many of the dogs in their gardens to go crazy!). But instead of straining to meet the other dogs are chase the deer (which would make any JRT huntsman proud), he stops and looks up at me! I was worried about him being too feisty or energetic but he seems to be very Poodle-ly in personality (rare for this mix by what I've been reading) and quickly accepts others as alpha. He does okay with young children, opting for the "You guys have fun, I'll just sit back and watch." approach when dealing with those noisy little humans. He enjoys walks, belly and ear scratching sessions, and chilling with the Neapolitan Mastiff next door (although I think their friendship is pretty one sided...). " Duncan the Jack-A-Poo at 5½ months old—"He appears innocent, but if you know anything about Jack-A-Poos, then you know better!" "This is my 8-month-old Jackadoodle Louis. 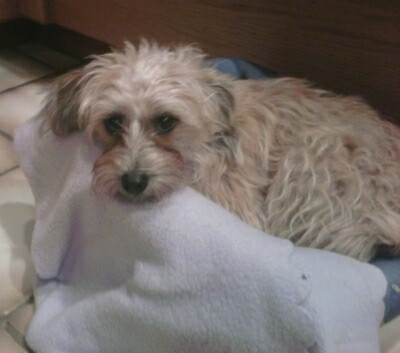 He is 3-quarters Poodle and a quarter Jack Russell. Very clever and easily picks up tricks. He doesn’t shed, but makes plenty of mess chewing things up! He’s a high energy pooch, very sociable and needs lots of exercise despite him only being small." 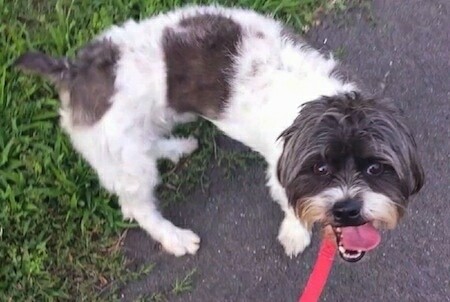 "This is Jackson our Jack-a-Poo shown here at 5 year old. He is a wonderfully sweet boy. We adopted him when he was 4 years old. He is a rescue but has come so far. I have to say that he is the smartest dog I have ever had. He learned sit and lay down in about 15 minutes. I have pretty bad allergies and asthma and he's the first dog that doesn't make me feel horrible. He has a long way to go before he's a well balanced dog, but boy is he working on it. Because of him being so smart he tends to be a bit on the hard headed side. The Jack-a-Poo is a great mix breed and are the way to go." "This is our dog Maddie, who is 9 months old in this picture, weighing 10 pounds. 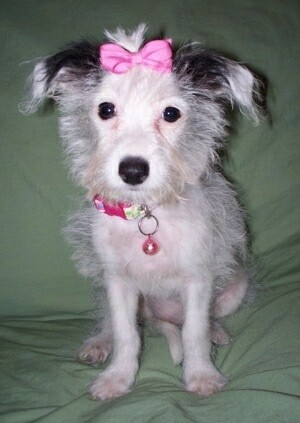 Her mother was a Jack Russell and her father was a Miniature Poodle. She is a great dog—loves to cuddle, go for long walks and fetch!! She is our first dog and has been a wonderful addition to our family." Lexy the female Jackapoo puppy at 3 months old—"Her mom is a purebred Jack Russell and her dad is a purebred Toy Poodle." J.J. the Jack-a-Poo puppy at 5 months old—"He loves to relax in our laps and in small spaces (i.e., under the couch or chair, in between the mattress and headboard on the bed)." J.J. the Jack-a-Poo puppy at 5 months old—In this pic J.J. was playing, playing, playing, then decided to take a nap break.